J is the title that scholars ascribe to the nameless writer they believe is responsible for the text, written between 950 and 900 BCE, on which Genesis, Exodus and Numbers is based. 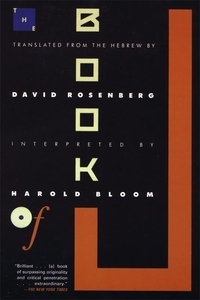 In The Book of J, Bloom and Rosenberg draw the J text out of the surrounding material and present it as the seminal classic that it is. In addition to Rosenberg's original translations, Bloom argues in several essays that "J" was not a religious writer but a fierce ironist and a woman living in the court of King Solomon. He also argues that J is a writer on par with Homer, Shakespeare and Tolstoy. Bloom also offers historical context, a discussion of the theory of how the different texts came together to create the Bible, and translation notes. Rosenberg's translations from the Hebrew bring J's stories to life and reveal her towering originality and grasp of humanity.